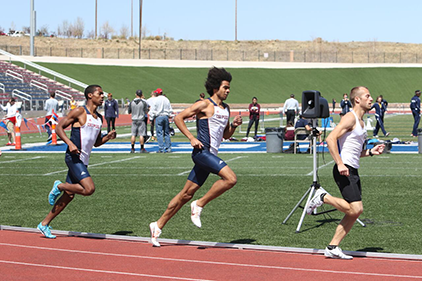 PUEBLO - A Colorado State University-Pueblo student-athlete with Jamaican roots has his sights set on the 2020 Olympics in Tokyo, but for now is excelling both in the classroom and on the track, which has brought him a significant amount of academic and athletic scholarships. As a high school senior, Derrick Williams was offered his first college scholarship by current CSU-Pueblo track Coach Matt Morris to run track at Carroll College, where Morris was head coach. When Morris took the head job at CSU-Pueblo, Williams followed, but at a cost. As an out-of-state student from Montana, Williams' tuition and fees would be nearly one and a half times that of a Colorado resident, or about $16,800 a year. His academic and athletic prowess have been a blessing to this ThunderWolf, who has been awarded a variety of scholarships for his athletic and academic achievements allowing him to attend CSU-Pueblo without an overwhelming financial burden. Derrick works hard in the classroom and on the track to receive an number of scholarships, including the Pepsi Scholarship, Battelle Scholarship, Carpet Direct Scholarship, Men's Track & Field Scholarship, and First Generation Scholarship. As a senior, Williams has maintained a 3.99 GPA as a biology (biomedical sciences) major with minors in general exercise science and chemistry. After job-shadowing Dr. Jennifer FitzPatrick, an orthopedic surgeon with Parkview Medical Center, Williams has decided to pursue a career in orthopedic surgery. He hopes to combine his passion for athletics with knowledge gained through his coursework at CSU-Pueblo. He wants to work with elite athletes to help them excel in their respective sports. "After observing the amount of time and care Dr. FitzPatrick gave each individual patient, I was inspired and wanted to be in that field of medicine. She epitomized the importance of patient-centered care and the true meaning of helping others," he said. 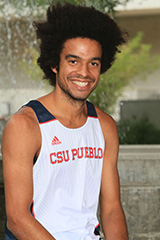 In his third year of competition at CSU-Pueblo, Williams serves as team captain and has compiled five All-American honors, including a 14th place finish at the 2016 National NCAA Div. II Cross Country Championships, a third place finish in the 1500 meters at the 2015 National Outdoor Track and Field Championships, second place finishes in the distance medley relay and the 3,000 meter races at the 2015 National Indoor Championships, as well as a fourth place finish in the Steeplechase at the 2016 Outdoor Track and Field Championships. Williams also has earned the prestigious Elite 90 Award, presented to the student-athlete at a national championship event with the highest academic record among participants. "Williams aspires to compete in the 2020 Olympic Games in Tokyo, but not before completing his bachelor's and master's degrees in business through the Hasan School of Business 3 + 2 program and completing two more years of athletic eligibility. "I am lucky that I get to run; I am lucky that I get to attend CSU-Pueblo. My father moved from Jamaica with the dream that his kids would have more opportunities than he had," Williams said. "CSU-Pueblo has provided me more opportunities than my dad ever hoped. My academic and athletic scholarships have given me the chance to focus on school. The pursuit of my passions in academics and athletics without financial concerns would not be possible without the support of this school and community." For more information, contact CSU-Pueblo Foundation Annual Giving and Stewardship Manager Sammi Mutz, at 719.549.2469 or sammi.mutz@csupueblo.edu.